Sixth-grader Ben Diaz thinks it’s quite a coup when the local pizza parlor lets him have all the old smelly balls from the ball-pit (more than a dozen bags full!) if he’ll just take them away. But when his father refuses to let him keep them in the family apartment, Ben comes up with what he thinks is a great idea: he pitches them through the open windows of his classroom, to be found by his classmates the next morning when the school day begins. The prank is such a success—and the principal so irritated at the unknown mischief-maker—that Ben decides the pranks must continue. 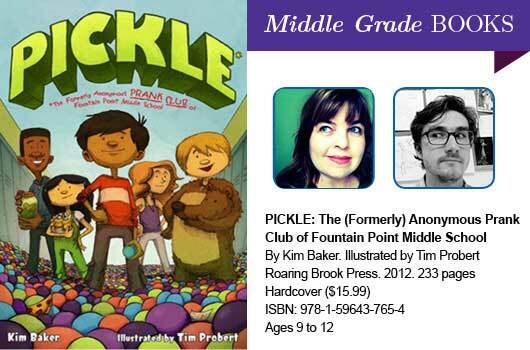 Meeting under the guise of the officially recognized League of Pickle Makers, Ben and four classmates team up to make their school year a little more memorable. Determined to keep their pranks essentially harmless and untraceable, but also to claim (anonymous) credit for them, they settle upon calling themselves the PTA—the Prank and Trick Association. In this lighthearted take on middle school life, Baker wades gingerly into more serious issues, such as broken families and the struggle to fit in, as she keeps her aim firmly on the intent to entertain. Quickly moving and sweet-tempered, Pickle will amuse readers wanting a few hours of fun.